Story behind your band/artist name: i smoked a Glamm cigarette in Paris and they were absoutely marvelous. I love glits and glam so i put together "Amour Glamour," meaning "Love Glam" in French. Band Members: Shane Malins - guitar, bass, synthesizer, omnichord, piano, drums, everything! At least 3 interesting/entertaining facts about the band related to persons/events in Washington DC area: once before a show, I was dared to swallow a live gold fish and I did! I felt it die going down my throat. the poor thing. I took my visiting grandmother to the White House because she wanted to see it and someone tried to mug us as we were walking to the car and grabbed her purse and tried to run away but then ended up dropping the purse while running! I saw Fidlar play at Howard theatre and managed to get on the stage and stage dive but no one caught me sadly. Anything else we should know, or you want to share: If Cher and David Bowie had a baby, it would sound nothing like my music. Story behind your band/artist name: Eco-minded DMV residents might recognize the fact that we share a name with the area's largest sewage waste water treatment plant. This choice was not accidental. Founding members Lee Cain and Adam Ortiz boast serious environmental credentials, with Ortiz heading up the Prince George's County Department of Environment and Cain currently serving as Director of Kingman Island, an oasis of nature on the Anacostia River. Bassist Brandon Miller also works for the DC Department of Environment. If you get the joke, good for you! If you don't, we think its a cool name that speaks to the band's love of nature and open spaces. What part of the DC region is the artist tied to and how? Where is the artist's current home base if not DC : Hyattsville, Maryland is home base for this band. Pete, Adam and Lee all reside in this up-and-coming neighborhood, which is filled with people representing all aspects of the creative arts. At least 3 interesting/entertaining facts about the band related to persons/events in Washington DC area: Adam is a guitar/guitar equipment hoarder. But he's trying to get the help he needs ;-) Pete & Lee met during Hyattsville's annual hops-hop, where neighbors troop from house to house drinking their fill and making new connections. As Director of Kingman Island, Lee has worked his fingers to the bone to help pull off the Island's annual bluegrass festival, but he also gets to do all sorts of weird things... like spreading tons of biosolids (otherwise known as sewage sludge) over areas that used to be paved with concrete. All part of restoring the island's natural beauty! Anything else we should know, or you want to share: Blue Plains will release its debut LP on February 7. Its a nine-track album featuring all-original songs recorded on vintage analog tape equipment with the venerable Don Zientara of Inner Ear Studios and mastered with Smithsonian sound engineer and Grammy winner Pete Reiniger. We have tried to craft an immersive experience that will speak to the heart and please the ear. Story behind your band/artist name: Bravery comes in many forms. Sometimes just following your dreams and being true to yourself can take bravery. Whatever life throws at you- be brave! Brave Like Us! At least 3 interesting/entertaining facts about the band related to persons/events in Washington DC area: Laura and Jay played in the same band, 'Rave Parade,' but not at the same time. They wouldn't meet for 2 more years. Laura and Jay finally met at IOTA during a 'Back to the 90's' tribute show, with tributes to The Cranberries and Green Day. Laura was singing for The Cranberries band, and Jay was there in support of his friend playing drums for the Green Day band. Laura invited Jay to play bass for her band "The Right-Handed Lefties" in which Jay replied, "I am a right-handed lefty." Story behind your band/artist name: It comes from the first book of poetry by Graham Greene, which was quickly pushed out of print but today is a rare collectors item. What part of the DC region is the artist tied to and how? Where is the artist's current home base if not DC : Most of us live in Alexandria, VA, but we generally play in DC proper. At least 3 interesting/entertaining facts about the band related to persons/events in Washington DC area: Dave and Ben (bass) are bureaucrats with the federal Government who indie rock by night. Ben (drums) was phenom child golfer. Anything else we should know, or you want to share: The band started in Dayton OH, but relocated to DC about a year ago. Story behind your band/artist name: People would ask if I was playing a gig solo or with the band, and I stared saying "yeah I'm playing with the Whole Magilla". It turns out it wasn't taken so we grabbed it! Band Members: James Ellis, Jim, lead guitar. John Dahlman, stand up bass. Olivia Ferrante, Vocals and percussion. At least 3 interesting/entertaining facts about the band related to persons/events in Washington DC area: I only started this thing 5 years ago! I wrote songs my whole life but never shared them. I went to an open mic in Wheaton and played out for the first time, and a year later I had a local label recording my first album. A couple years ago I played a gig at O Mansion and ever since I've been an artist-in-residence there and record a radio show for an English radio station once a month. Last summer I played the lead in an Americana Dust Opera called Rain Follows the PLow at the Atlas with Capital Fringe. Last November I wrote a song called "Brighter Day" and it was picked up by a play at George Mason University. I got to perform! I am 6 foot one and have hit my head on the ceilings of many DC live music establishments. Anything else we should know, or you want to share: I just recorded an EP with Austin Bellow of Forever the Sickest Kids- will be released in May. I can shoot you links to those if you are interested- really new direction and lots of guitar distortion! 1. Caroline was a guitarist at the Hirshhorn Museum in the "Woman in E" performance art piece. 2. Erich was in a Jeff Rosenstock music video that was filmed at Comet Ping Pong. 3. Caroline won the Miss Northern Virginia 2018 pageant and played electric guitar in the Miss Virginia talent competition. What part of the DC region is the artist tied to and how? Where is the artist's current home base if not DC : We began in 1986 as part of the local folk scene revolving around Mary Chapin Carpenter's open mic nights at Gallagher's in Cleveland Park. We rehearse in Vienna and Silver Spring. 2. Lead vocalist Caldwell Gray is the head sound engineer at Strathmore Performing Arts Center. 3. Our song "Hoyt Wilhelm" was recently played on Tony Kornheiser's baseball opening day podcast. Anything else we should know, or you want to share: We've been together since 1986, and are celebrating the release of a new CD (our 10th) entitled "Bone,". CMJ describes our music as "sweet ol' roots rock with a healthy amount of restless big city experimentalism." We rock twice as hard as bands half our age. Band/Artist Name & Pronunciation: Catscan! Story behind your band/artist name: Electronic rock duo Catscan! was born at the dawn of the 21st century. Two elementary schoolchildren decided it would cool to start a band, even though piano and euphonium proved to be a challenging starting point. The boys learned to play and write as a unit, working pretty much in isolation for the first decade. 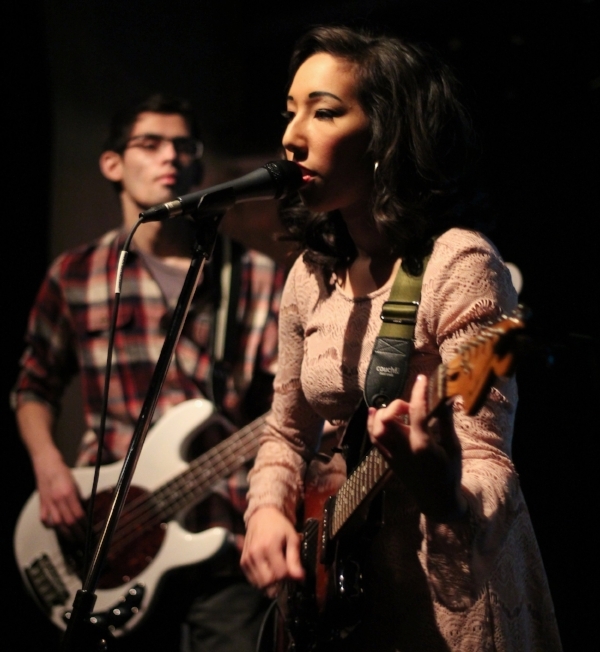 The second decade has been all about finding their place in the DC music scene. The Catscan! partnership has produced dozens of albums, live shows, music videos around hundreds of songs across a variety of genres. Their longest running and most current project, a podcast called SONGO, yields one new "song o' the month" every month. What part of the DC region is the artist tied to and how? Where is the artist's current home base if not DC : We have spent a lot of time on U Street at Velvet Lounge and nearby venues. We both live in Virginia but very much consider the band to be of and therefore from Washington DC. Story behind your band/artist name: There's not really a story. Caleb Hacker is my actual name. At one point I thought of changing it to Caleb Rekcah. Rekcah being my actual last name spelled backwards, but after some wise advice from several close friends I decided to stick with the name I was given at birth. What part of the DC region is the artist tied to and how? Where is the artist's current home base if not DC : I currently live in Lorton, VA only about 20 minutes from D.C.
At least 3 interesting/entertaining facts about the band related to persons/events in Washington DC area: 1. The first show I ever played, just me and my guitar, was in DC for a breast cancer event. I was 18 at the time. 2. One of my favorite artist is Brandy and earlier this year I got to meet her, for the first time, at the Kennedy Center in DC. Not only did I get to meet her but I sang for her and recorded it so i get to relive that awesome moment over and over again. It's posted on my Instagram and YouTube channel. 3. My granddad was the fifth black admiral in the US Navy and a has a display honoring him, along with several other prominent black military officers, in the Pentagon. Anything else we should know, or you want to share: I post a lot of covers on my Instagram and YouTube channel and i've had some pretty awesome artist see my covers and give me a shout out. From Snoop Dogg and Meghan Trainor (she actually posted my cover of her song "Lips Are Movin" on her Instagram page) to Erik Hassle and T-boz of TLC.